Two well-known Eastern printmaking galleries, in Providence, Rhode Island, and Alexandria, Virginia, have collaborated on a “Joint Venture” small-works show featuring boxed portfolios of original prints. The boxed portfolio collection contains 31 hand-pulled prints. Each of the prints, shown framed on the walls, will be on display in Printmakers Inc. Gallery at Alexandria’s Torpedo Factory Art Center from Nov. 1 through Dec. 31. An opening reception will be held 2-4 p.m. Sunday, Nov. 2, and a holiday evening reception 7-9 p.m. Friday, Dec. 5, at Printmakers Inc. gallery. The show has just been on display in Rhode Island and will return in 2015 to art galleries there and to the Bristol Art Museum. The collaboration is between the Providence Art Club of Rhode Island, founded in 1880, and Printmakers Inc. in Alexandria, nearly 40 years old, the Washington region’s only group studio dedicated to the art of original, hand-pulled prints. 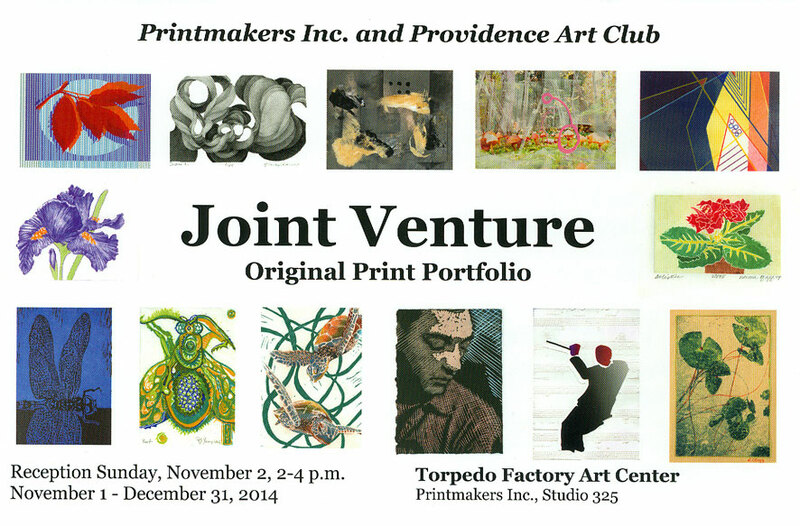 Printmakers Inc. is in Studio 325 in the Torpedo Factory, 105 N. Union St., Alexandria. The unusual “Joint Venture” features 31 artist prints, all 5×7 inches, in hand-crafted boxes. All of the boxed prints, on archival papers, are shown framed on the walls. The individual framed prints also are for sale. Only 15 boxed portfolio collections are for sale, at $550, or less than $15 each for the original, hand-pulled prints. Signed and numbered, the prints showcase historic printmaking techniques, including etchings, lithographs, woodcuts and new 21st C. UV polymer technology. The prints, including many color prints, are of birds and animals, landscapes, people and abstract designs. Of the 31 prints, 22 are by New England artists and nine by Washington-area artists. Participating artists from Printmakers Inc. are Penelope Barringer, Judith Coady, Avis Fleming, Laura Huff, Kelly O’Brien, Norma Pfaff, Patrick Sargent, Carolyn Witschonke and Priscilla Young. For further information, contact: Judith Coady, 703-395-9137 or pjcoady@aol.com; or Priscilla Young, 703-447-0803 or lunamoth.art@gmail.com. This entry was posted in exhibitions, new work, openings and tagged Joint Portfolio Project, Providence Art Club. Bookmark the permalink.